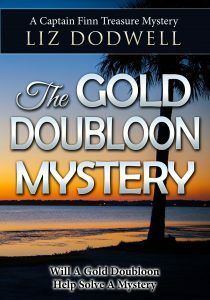 What does a shipwreck gold doubloon have to do with the murder of a seemingly ordinary insurance salesman? Famous treasure hunter, Captain Finn, with his sidekick, Phillida Jane Trent, find themselves in danger as they search for answers. It’s not unexpected that a gold doubloon would be found in the waters off the east coast of Florida. After all, a whole fleet of Spanish galleons wrecked there in 1715, with cargoes of gold, silver and jewels. What is surprising, is the way in which the coin is found. The local police turn to Finn for his expertise and, before you know it, he and Phill are in the thick of the investigation, and in danger.